SCVHistory.com | Ridge Route-Gorman Area | Pyramid Lake and Substation Mark 26th Year. Pyramid Lake (top) and Sheriff's substation (above). Both opened in 1974. Photos: Estelle Foley. Pyramid Lake was built in 1973 by the state Department of Water Resources, operator of the state water system. Located amid the rugged hills of the Angeles National Forest in northern Los Angeles County, the lake's surface area covers 1,297 acres, with 22 miles of steeply rising shoreline spreading out to arm-like waterways through the canyons. Pyramid Lake is a reservoir of the California State Water Project, holding 180,000 acre-feet of water (about 58.5 billion gallons), imported by aqueduct 400 miles from Northern California. The water drops by tunnel 37,000 feet near Castaic Lake, spinning turbines at the Castaic power plant. 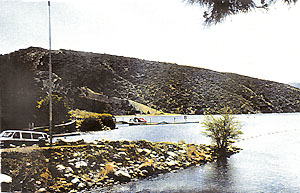 The lake derives its name from the Pyramid Rock formation of the Piru Gorge, which forms one side of the dam. Ever since the completion of the dam and lake, law enforcement has been administered by the county of Los Angeles — first under authority of the Harbor Patrol, then by the Sheriff's Department. 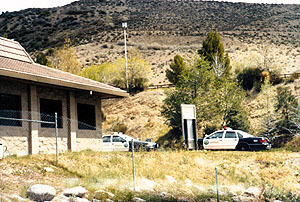 The six deputies at the Pyramid Lake substation are responsible for the enforcement of all laws — penal, fish and game, vehicle code and boating — for the lake and the nearby communities. The deputies are also charged with the education and safety of the 200,000-plus visitors to the lake each year. A boat launch ramp, swimming beach, picnic area and other facilities are available to the public. Summertime hours are 6:30 a.m. to 8 p.m.